Televisions just keep getting bigger and bigger, but you’ll pay a pretty penny to get a few more inches of screen size if you go the traditional TV route. A projector, on the other hand, can give you a variable screen size that goes a lot bigger than even the largest TVs you can find in the store—and you can get one for a lot less than you might expect. If you’re looking for the best 1080p projector under 500 bucks, give the four options below a look. All of them will give you a great viewing experience for right around the $500 mark—and some of them cost even less than that. You might be surprised by all the features you can find on a projector without shelling out a whole tone of money. Let’s start things off with this model from Optoma. Now, we’ll be clear about this right up front—you won’t always find it available for less than $500, but even at its higher price points it’s close enough to this benchmark that it should fit into similar budgets. Considering what all you get when you buy it, you’ll almost certainly find the extra expense to be well worth it. The picture is the most important thing about any TV, and on that front the Optoma HD142X definitely delivers. It gives you up to 3,000 lumens of bright, beautiful color, the entire way across the REC.709 spectrum, the current standard for HD television. This means you’ll get accurate color representation for movies, games, and broadcast TV sent according to ColorSpace specifications. This great contrast also ensures the black sections of the screen will be truly black, adjusting the lamp for each frame automatically for sharp on-screen contrast. The Optoma HD142X also gives you high-definition detail with an on-screen resolution of 1920X1080 pixels. This is ideal for watching movies on Blu-ray without any compression or alteration to the scale. Along with HD picture, it also has the capability to project 3D content from any source, whether it’s a Blu-ray movie or a game played on your console. The fast, 144Hz refresh rate means you’ll get smooth playback with no flickering. The sound is one place that many projectors under-perform, but that’s not the case with this unit. There’s a 10-watt speaker built right in, giving you much clearer, louder audio than you’ll get from most projectors. It won’t out-perform a home theater, but the speakers are on par with what you’ll get built into most TVs. Everything about this projector is designed to fit easily into your media set-up. It has two HDMI ports for gaming systems, streaming sticks, and other media sources. It also has an MHL port that you can use to connect a tablet or smartphone. With a screen size between 65” and 107”, you’ll get the premium theater-level viewing experience you’re looking for, and for a very affordable price considering the features. Here’s another similar option from Optoma—in fact, another projector from the very same product line, as you might guess from the nearly-identical names. It shares a lot of great features with the HD142X and surprisingly fits into the same very affordable price point, even though it’s arguably an improvement over the model above. Like the HD142X, this projector gives you a 1080p screen resolution from a lamp with up to 3,000 lumens of brightness. The picture is even better, too, thanks to improvements to the contrast ratio and color accuracy. It also still gives you the option of viewing real 3D content—something that’s becoming more and more useful in a home theater context. While the picture quality improved slightly between models, the changes to the build and design were more noticeable. It’s a bulkier projector with a more substantial lens mechanism. We actually liked this about it—it feels more solid like it’s built to last—but it can make things tricky from an installation standpoint, especially if you usually use a ceiling-mounted system. The biggest change from both a screen and design standpoint is to the throw ratio and screen size. You can get a much larger screen with the HD143X—up to 300 inches if you have a large enough space. The throw ratio is also more flexible, so you have more options when it comes to the installation. With all the improvements Optoma made between these models you’d probably expect the 143X to carry a bigger price tag. This is why we were especially impressed that you can still get this projector for less than $500. If you’re looking to get the best bang for your buck, the Optoma 143X is a definite contender. BenQ is a name you might not expect to see on a list of affordable projectors. They’re a brand that’s more often associated with high-end performance than budget-friendly options. The MH530FHD skates right at the edge of the 500 dollar price limit (and sometimes goes a bit over it, depending on where you’re shopping) but it’s definitely still very affordable and an excellent value, considering the quality. Other than resolution, the lamp brightness is the key statistic to tell how clear the picture will be in a practical, real-world application. At 3,300 lumens, this BenQ projector is one of the brightest on the list. And you can definitely see the difference, especially if the projector has to compete with any ambient light. With a high color accuracy and contrast ratio to match, it’s safe to say this projector produces the best picture on the list. This is also a very versatile projector. The short-throw lamp makes it the perfect option for a smaller space. You’ll still need some distance if you want the full 300 inches the projector’s capable of, but you can get a screen of 100 inches or more in even a small room. There’s also a 1.2X zoom for fine picture adjustment. It is missing some features you’d expect from other BenQ models. There is a keystone adjustment, but the only easy way to access it is with the Quick Install button—after set-up, these adjustments are harder to make. This won’t be a problem if you’re mounting the projector or otherwise don’t plan to move it much after it’s installed, but it is worth noting. Some pro-level companies slack off on their more affordable models. We’re pleased to say BenQ hasn’t done that here. The performance from this projector is incredible for the price, both in terms of picture quality and usability. BenQ MH530FHD DLP Projector Unboxing & Review | The BEST Budget Gaming Projector? The ViewSonic line of projectors gives you a high-quality option at pretty much every price point. The Pro7827HD projector is one of the greatest valued options in their catalog. The image might not be as bright or sharp as with their top of the line PX747-4K, but considering it costs less than half as much, it most definitely gives you more bang for your buck. This projector is designed with home theaters in mind. The full HD picture has a resolution of 1920X1080p and can go up to a size of 300 inches—a truly massive screen that will make you feel like you’re at the movies. The colors are life-like, using an RGBRGB color wheel so you’ll get the accurate, cinematic hues that make a movie really come to life. They’ve even made upgrades to the audio over other projectors, with two built-in speakers. They may not give you the Dolby experience of a movie theater, but they’ll at least fill up your living room with sound. This model is also exceptionally easy to set up and connect to your other devices. It has three total HDMI hook-ups, more than most projectors, as well as a port for A/V and VGA. It can be connected to pretty much any game system or dedicated media player, and it also plays nice with laptops and smartphones, so you can view content from anywhere through this projector. >>> Our guide how to use projector with a mac The relatively short throw ratio also gives you more versatility and options when it comes to where you want the projector in your home. For ease of use and value, this is definitely a strong contender. Here’s another excellent option if you’re looking for a combination of high video quality and an affordable price. With a brightness of 3,300 lumens and a maximum screen size of 280 inches, it has stats on par with the other items on the list—but is even more affordable, and has other strengths, as well. The ohderii GP100 uses an LED light source rather than a bulb. This makes it more efficient, keeping the heat level relatively low, which in turn allows for a quieter cooling fan. LED bulbs also have an impressively long life, in this case, up to 30,000 hours—plenty for even frequent TV viewers. As an added bonus, it can be viewed equally well indoors or for night-time outdoor use, letting you host backyard movie nights with ease. The resolution on this model isn’t quite as high as with the two above. It can support a maximum of 1920X1080p, but the native resolution is only 720p, meaning you may see some graininess or pixilation, especially at larger screen sizes. It also can’t get quite as large of an image as other options. The maximum size is comparable, but you’ll get a better quality if you keep it to around 120 inches or less. Of course, this is still a very large screen, especially compared to the size of standard TV you could get for the same price. The on-screen resolution for this projector isn’t high enough for intense gaming, and you won’t get extras like 4KHD or 3D. If you’re looking for top image quality, you might be disappointed with this unit. If you’re mostly looking for an affordable way to take your home theater to the next level, though, this projector will satisfy. If you’re looking for the brightest lamp you can get for less than $500, you’ll want to look at the ViewSonic PX700HD. It’s from their much-touted PX line of projectors, and while it’s the entry-level model for that line, you’ll still benefit from the cutting edge technology utilized in these impressive projectors. If you just looked at the feature list of the PX700HD, you’d probably expect it to cost twice as much. Both HDMI inputs are compatible with 3D Blu-rays. There is also a powered USB slot for easily connecting wi-fi dongles or other content sources like flash drives. No matter which input we used, there was absolutely no lag—it feels just like controlling a standard flat-screen, making it perfect for gamers. In terms of the picture, it uses the same SuperColor system that gives you the bright, cinema-quality colors you want in a home theater. It also has different performance modes that let you quickly adjust the settings for different purposes. There’s a Sports Mode for faster response and sharper detail, and an Eco Mode that reduces brightness, conserving energy and extending lamp life. Just about the only people who might not be happy with the performance of the PX700HD are those with smaller spaces. It has a standard throw ratio, so while you can get a projected image up to 300 inches, you’ll need a lot of distance between lens and screen to get it there. The zoom is limited, as well, at least compared to other models in the ViewSonic PX line. If you’re not in a restricted space, this is an incredible projector for the price. The Ultimate Budget Home Entertainment Projector !!! If you’re looking for the absolute cheapest projector you can get that will give you 1080p resolution, you’ll love this one from Dr. J. It’s by far the most affordable way to get the massive screen a projector like this can give you. There are concessions you have to make to get this low of a price, of course, but it’s still an incredible value if high-resolution playback isn’t as much of a concern. This projector will support up to 1080p, but like the model above that is not the default setting. The native resolution is only 840X480p, and you may experience some fuzziness or pixelation in the picture, depending on what content you’re viewing and where it comes from. It’s also plenty bright for home theater use. The included lamp gives you up to 2,000 lumens, about 10% brighter than a lot of what you might consider to be budget projectors. This light is projected using diffuse reflection technology, so you won’t be looking directly at the light source and your eyes won’t get as tired from extended viewing. The speakers on this projector exist, but they’re not the greatest—you’ll probably want to hook it up to some kind of external speaker system, even if you’re only using it for personal viewing in your home. The fan uses a lower-noise design, but it’s still not completely silent, so keep that in mind when you’re deciding if you need external speakers. Aside from this small snag, this projector is very functional and easy to use. It connects to a lot of different devices and has USB and HDMI ports as well as spaces for A/V hookup, a VGA port, and a slot for TF cards. The 2018 upgrades to this projector really give you a huge bang for your buck, making this the ideal way to satisfy your home theater needs on a budget. In terms of overall performance, our favorite projector at this price point is the ViewSonic PX700HD. It’s not only the brightest projector on the list but the low lag and various performance modes make it versatile for a wide range of different uses. The only thing the PX700HD won’t do is work in a small space. If you need a short throw projector, the BenQ MH530FHD jumps to the top of our list. It’s a bit pricier than the ViewSonic but it has a comparable picture and even better adjustment options. In truth, though, all of the projectors on this list have their definite strengths—and none of them will put a big dent in your bank account. The big lesson here is that you have a lot more options than you probably realized when you’re looking for a 1080p projector on a budget. 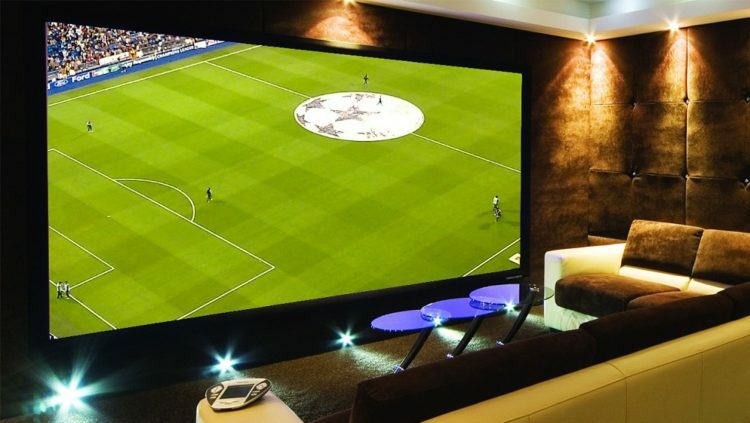 If the high price of flat screen TVs has been keeping you from setting up your home theater, switching to a projector just might be your answer.